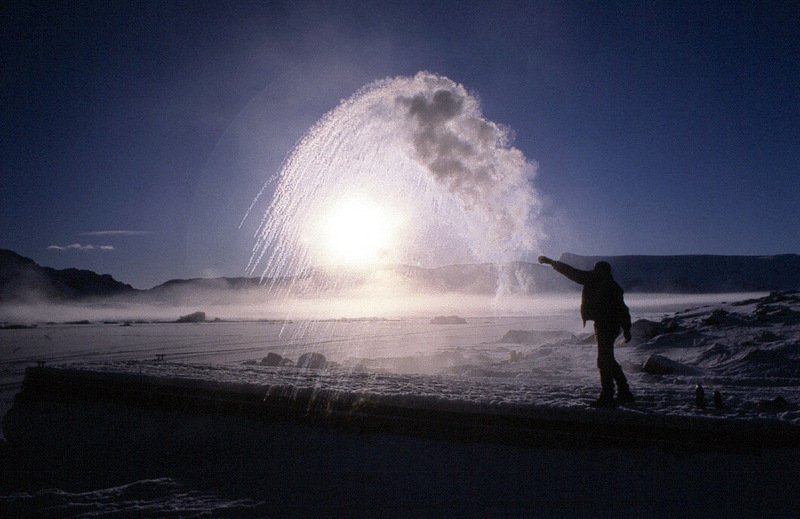 #A fun thing to do in extreme cold is to throw hot water into the air. Take a flask and fill it with boiling water to warm it up, pour this away and fill it again. Take the full flask outside, take a cup of this hot water and throw it all up into the air. As the +100°C water meets the cold (in this case -32°C) air, it instantly vapourizes. Most of it is turned into a cloud of steam that drifts gently away and some of the droplets that stay together are instantly turned into small pieces of ice that can be seen streaking down towards the bottom left in this photograph.